Holly's Blog A surprise ending, Carlin Home Companion, Entertainment Industry Blogs, Feathers and Toast, Holly Payberg, How to get a television deal, How We went from Youtube to a Television, Judd Apatow, Kelly Carlin, Mhairi Morrison, Shonda Rhimes, Sick In the Head, Small Screen Big Screen, The Comedians, Year of Yes. permalink. Thanks Momma. I know there will be many more challenges ahead but I think this was the biggie. So grateful for all your help, especially through the struggle of these last couple years. Love that quote. And thanks so much for all your love and support. Means a lot coming from one of the sweetest ladies I know. I’m so thankful everyday that Gerry has you for a best friend. 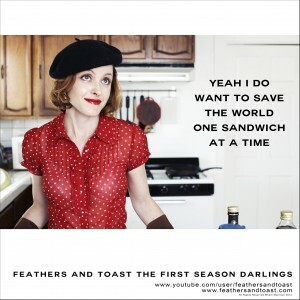 Love that saying darling thanks for sharing. Having faith has we speak with renewed vim and vigor. Thank you. I saw the enthusiasm and incredible talent when you were growing up. You and Amy were best friends and you did awesome things. You can do anything you set your mind to and like your mother wrote…. You have already taken care of the obstacles. Good luck in all you do.And I want to add that you have an awesome family. Diego is gorgeous, talented and adores you. Your daughter is beautiful like you and appears to have your talent. Thank you so much Karen for your sweet words. I was always so grateful for having you as a second mom during those awkward formative years. Amy is a lucky girl. As this part of your journey ends, as ‘weird’ as it may seem, you did discover your fear and the only limitation to your success was basically ‘you’ selling yourself. So as difficult as it was…conquering it is a HUGE success in itself! We know that your continued fortitude and determination will triumph because you’ve never let any obstacles stop you or your dreams. I know at times the doors don’t seem to open as quickly as we want them to but your growth this past year will begin to open those doors at just the right time and bring the change you’ve worked so hard for. Get ready because your time to shine in the spotlight is coming…we’ve seen it all along! Love….your BIGGEST fan! That is exactly what I needed to hear, right when I needed to hear it. Thank you. Love you. You have always been my greatest fan and I am so grateful for that. Wow. Gives me goosebumps, Holly! Amen to what Norma said. Thanks so much Anne. You are by far one of the coolest ladies I have met in a really long time so this means so much to me coming from you. The past year has been such a pivotal part of our artists journey and I’m so grateful to have you along for the ride.